This latest trailer of Marvel’s Jessica Jones has me counting down the days until the series is released on Netflix in all it’s binge watchable glory. In the video we find out that Jessica (Krysten Ritter) has a nemesis who can make people do anything he wants. You can see glimpses of Doctor Who’s David Tennant who will play villain, The Purple Man aka Dr Zebediah Killgrave. He seems to stay mostly in the shadows but I think it will be great to see Tennant play a villain. We also see a relationship between Jessica and her future husband, Luke Cage (Mike Colter) forming. A new Netflix series Luke Cage will air in 2016. If you are still unaware of who this she is the full official synopsis of Jessica Jones says: “Ever since her short-lived stint as a superhero ended in tragedy, Jessica Jones has been rebuilding her personal life and career as a hot-tempered, sardonic, badass private detective in Hell’s Kitchen, New York City. 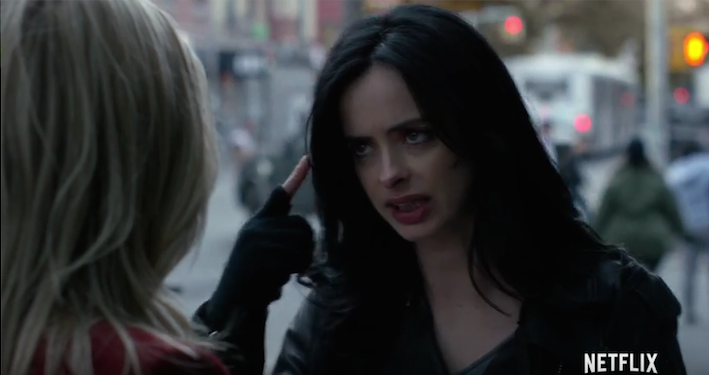 You can catch all 13 episodes of Jessica Jones on Netflix from 20 November.